The Verkhovna Rada, Ukraine's parliament, has rejected a no-confidence motion in the government. A total of 203 MPs backed the decision on Thursday. They included 172 Regions Party MPs, one Bloc of Yulia Tymoshenko MP, ten Our Ukraine-People's Self-Defense Bloc MPs, and 20 Communist Party MPs. 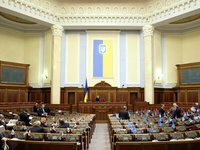 Bloc of Lytvyn MPs did not participate in the vote.